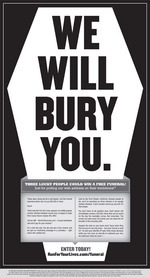 Earlier this week, Run For Your Lives, an organization that hosts a "zombie infested 5K obstacle course race," placed an ad in the Wall Street Journal with the headline, We Will Bury You. 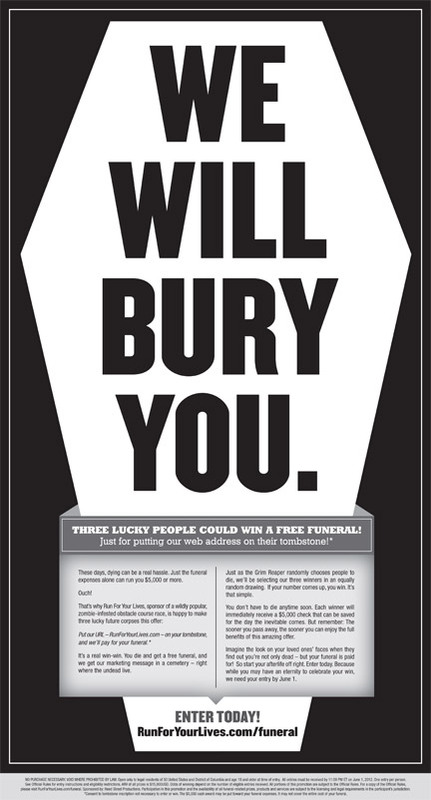 The ad promised three people the chance to win a free funeral. Actually, the ad promises $5,000 which will be sent to the winners immediately. We guess it's up to them whether or not they set aside the money for funeral expenses or blow it all on a vacation. The stunt is to promote the organization's races which occur in several locations over the course of the year.